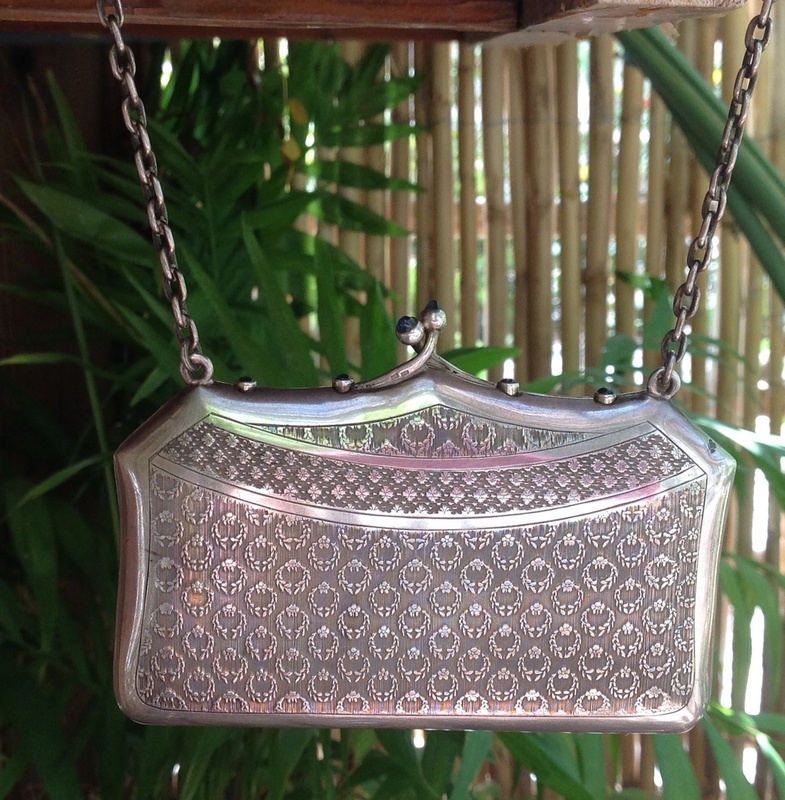 In Silver > Art Nouveau Silver > Show & Tell and Bags > Handbags and Purses > Show & Tell. I am lead to believe that this is an import. You will see from one of the photos that it is marked Sterling, F, representing foreign, a sun with Rays and a face, which is the London import Mark 1904-05. There is also a S but I do not know what this stands for. The silver bag, or do you call them Vinaigrette? is very heavy, approx 250 grams. I feel that it might have been made in Germany. 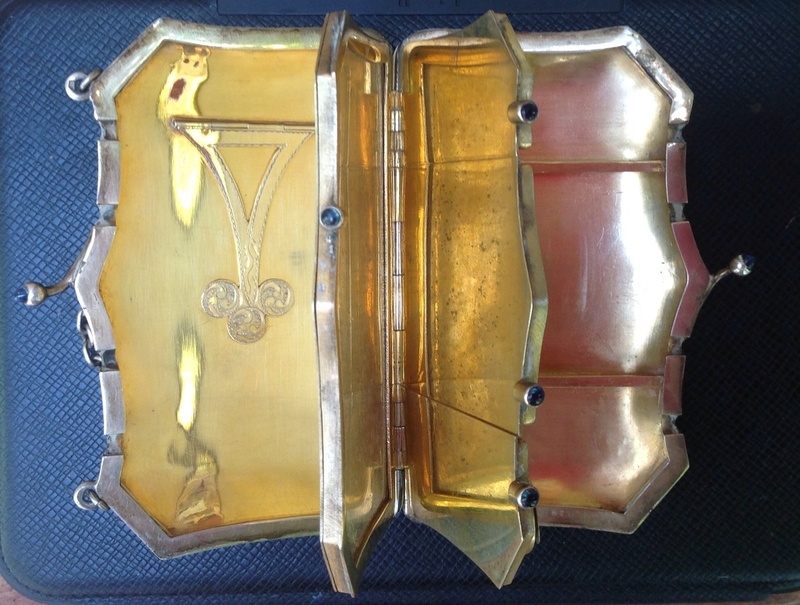 It has a lovely Silver patina outside, and is Silver gilt inside. I am not sure if the outside has been machine or hand engraved. There is a heavy silver chain for the strap. On the inside there are three compartments. One is a triple compartment to contain rouge, power other types of makeup. The central one houses a mirror, and the other a clip which I think are for visiting cards. These separate compartments open and close by Sapphire blue cab stones or glass. Along the hinge line, which I have not shown is a pencil holder, unfortunately there is no pencil. The whole construction has been very well made. It measures approx 11 cm long, and at its widest point 6 cm. wow!!!!!!!!!!!!! just beautiful and lovely!!!! 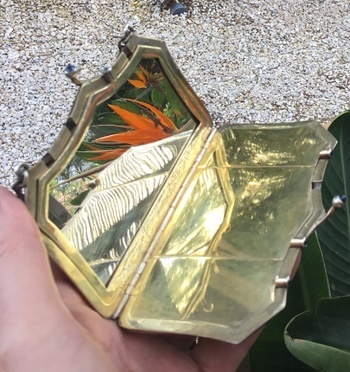 A vinaigrette is a small locket or chatelaine box where you can put a sponge with perfume under an inside pierced second lid. 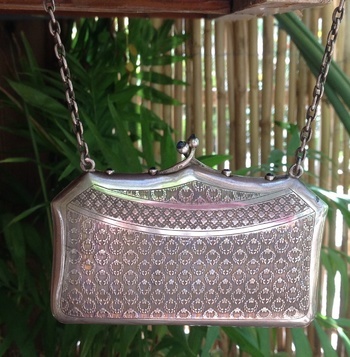 Your model is called Minaudière or dance purse :-). The mirror count in the weight feeling! Plus, you have on pic #2 two coin holders (interesting, as rather encountered in men's fob...). 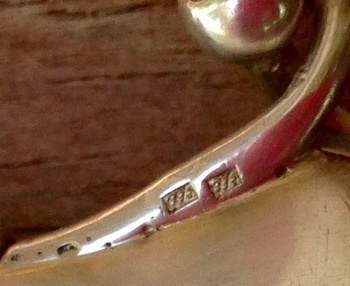 I can see 2 rectangular hallmarks in pic #1 on the kiss closure, what are they? Hi Kyra, This is the best I can do. There are 3 mark one to the left of the 2 oblong marks which is a oval shape. The 2 oblong marks look like 3 spots in 3 diagonal lines. Oh well at least I know what I'm doing tonight, thanks again Kyra. This is just amazing Pease!!! What a great piece to have! I have used my diamond selector on some earrings I know are sapphire, then I tested the stones on this piece and the stones register has Sapphires. Thank you inky, for passing by and leaving a lovely comment. I have cleaned the marks I have found and put 3 photos of the hallmarks or makers marks, one of them looks Chinese, but I doubt that some how. Hi Kyra, could the second photo be D E. Do you think this is German? if not do you have any idea from which Country this is from? Many thanks for your help, your a Angel. I've been looking at the marks from Hanau, Germany there are a lot of cursive maker Marks, but yet I can't find anything resembling these marks. I don't think German, it would bear 800 or 900 for the silver alloy. Found nothing for those beside sterling mark. I have been looking as I said at Hanau, they did export Sterling for the British market. Still haven't found anything. I'm not much into purses Jean, but this is soooo beautiful! Gloria would kill for it! I'm sure Gloria wouldn't kill me for this, lol. I must admit, it's a bit of a mystery, Rick. Hi Shareurpassion, sorry I've just reread my thread and see I haven't said thank you for your comment. I've spent ages trying to find these marks, I still think it's from Germany but on the whole I'm stumped. Thank you Agram.m, for nice comments and love. In the UK we have many vintage retro the most popular are Stratton, Tallent, KIGU. I collect them and you can have many variations from men's cigarette compacts to ladies vanity or combined ones which contain almost anything. Ladies powder ones come with a little dabbing sponge cloth! I recently a Ronson, Mother of Pearl which was stunning. Hi GeodeJem, I also have some Stratton compacts, thanks for your comment and love. I hope to see some of your compacts in the future. An old and long post.There is Austria-Hungary import mark 1901-1921, letter P indicates Budapest (picture 3). Hi IVAN, I've just seen your comment regarding this post. Thanks so much for your comment I really appreciate it. I've recently had the mirror restored, luckily I found someone who does restoration of these wonderful old mirrors. Recently I had the mirror on this compact resilvered in the traditional method. It wasn't a easy task because very few people do this type of work. The person who did it told me the glass was old and measured 1mm thick which is extremely rare. As you can see he's made a terrific job.